Update 27 nov: the app is now out of beta. See this blog post. Update 2 sept: a beta version is now available, see comments below. Update 9 sept: beta two is now available, including a version for Windows! See comments below. How cool is this?! The picture above shows a BMV battery monitor, connected to the USB port of an Android phone. All that was necessary to do this was to use our standard VE.Direct USB interface and a readily available USB On-The-Go cable. 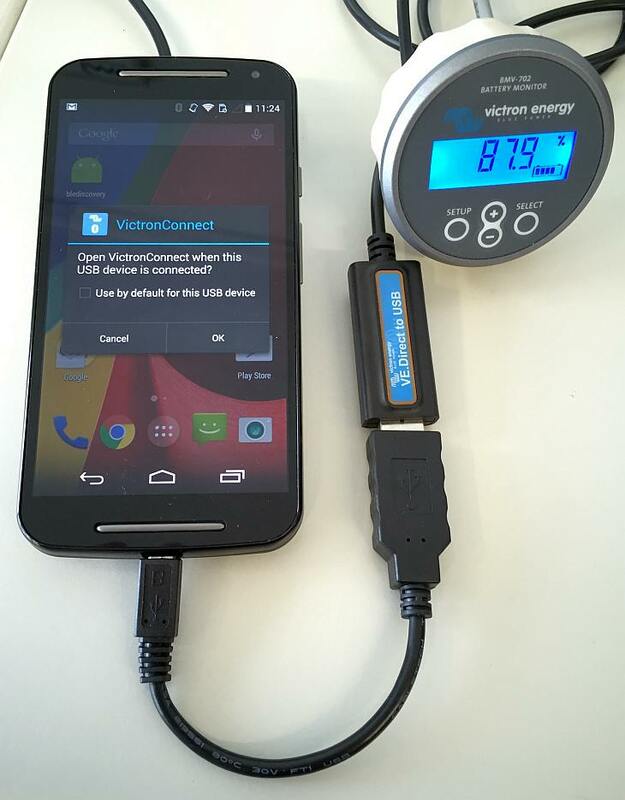 The App that you see running on the phone above is the new version of our Victron Connect App. When the developer, who has been working on this App, came into work this morning he looked rather tired and not without reason; as yesterday he found a shop that sold a USB On-The-Go cable. This resulted in him working for most of the previous night on his current project; the new version of the Victron Connect App and getting it to work straight from the USB port of his phone. The resulting outcome is that it all works well, which will be very handy when installing a BMV or MPPT Solar Charger. For those of you with an iPhone, like myself, this probably won’t work. Though we haven’t thoroughly checked yet, Apple usually does not support these types of connections. At least not without first having to go through a design review and licensing program, that is so lengthy and time consuming that it is not worth the effort. 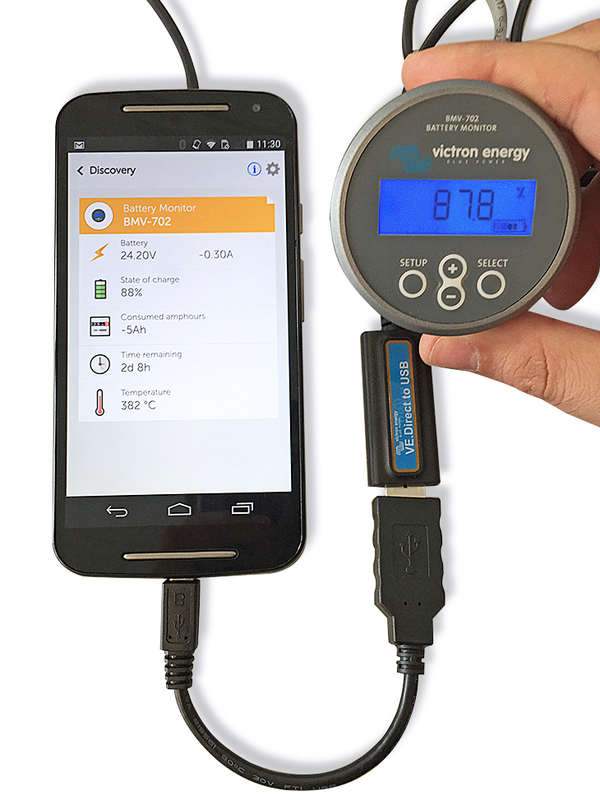 Add changing settings of BMVs and MPPT Solar Chargers with VE.Direct port. Read-out of MPPT solar charger 30 day history. In conclusion please be patient as this new App is coming soon. And, for the tinkerers among you, there is also good news: the App will be Open Source. Have a good day! Matthijs.